The Elvis DAM plug-in for InDesign Server allows you to open InDesign files managed in Elvis. It also makes sure that missing links to files stored in Elvis will automatically be resolved. For information about compatibility of the Elvis InDesign Client with Elvis, InDesign and Smart Connection, see the WoodWing Compatibility Matrix. Each InDesign instance requires a separate user license (a Basic license or higher). Step 1. Download the Elvis InDesign Server plug-in from the Elvis Software download page. Step 2. Unpack the file and copy the Elvis folder into the Plug-ins folder of InDesign Server. Logins from InDesign Server need to be given access to the Elvis Server by setting the user permission in the Elvis InDesign Client. Step 1. In the Elvis Desktop Client, access the Manage Permissions tab. 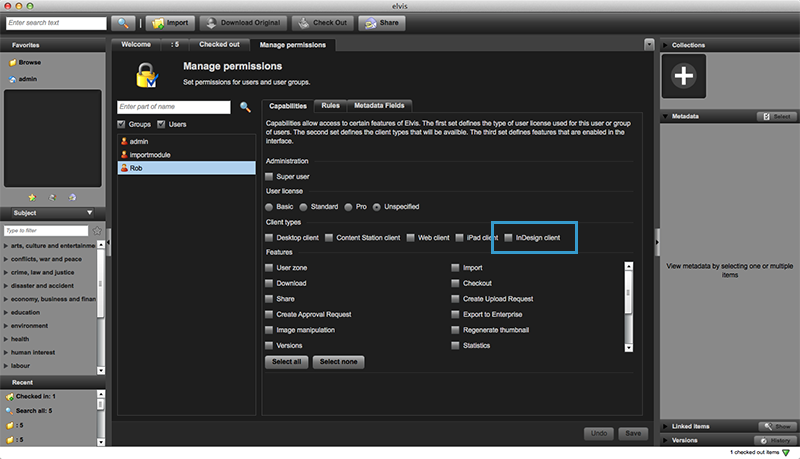 Choose System > Manage Permissions. Step 2. Locate the user or user group who should be given permission. Step 3. Under "Client types" in the Capabilities tab, select InDesign client. For more information about Capabilities, see Capabilities in Elvis DAM. (Elvis plug-in for InDesign Server 1.x only) The Elvis InDesign Server Client automatically resolves links to Elvis images placed on a layout. In order to have this working correctly all placed images must have an Elvis asset ID embedded in their metadata. When editing an image in an image tool which removes this XMP metadata from the file, the auto resolving will break. Example: This can occur when editing the image on Mac OS X using Preview. For Elvis DAM versions older than 4.6.1, the asset ID is not embedded by default. To fix this for existing assets in installations older than version 4.6.1, read the instructions for upgrading from Elvis 4.x to Elvis 4.6 on the Upgrading Elvis DAM page. InDesignServer -port <port_number> -elvisserver "<elvis_server_url" -elvisusername "<elvis_username>" -elvispassword "<elvis_password>"
InDesignServer -port 18383 -elvisserver "http://elvis.woodwing.net" -elvisusername "username" -elvispassword "password"
In the console you can find a line that indicates if the login to Elvis was successful or not. The scripting event Document.ELVIS_DOWNLOAD_COMPLETE is dispatched as soon as all linked Elvis files are downloaded and all links to these files are resolved for a document that was opened. When the opened document does not have links to files in Elvis this scripting event is still dispatched.